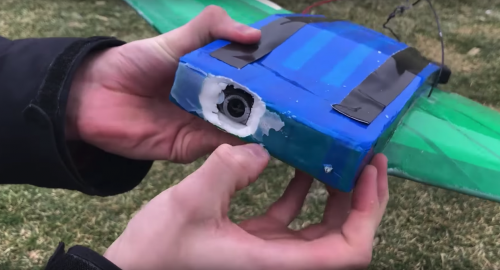 RaptorTech’s goal was to drop a glider from the edge of space, and with a Raspberry Pi and a high-altitude weather balloon, their vision became a reality. The goal of this project was to drop a glider from the edge of space using a high altitude weather balloon. The glider is entirely homemade and uses the opensource Pixhawk flight controller + a Raspberry Pi Zero to disconnect at the desired altitude and fly to a predetermined landing location. Here at Pi Towers, we thoroughly enjoy the link between high-altitude balloon (HAB) enthusiasts and the Raspberry Pi community, from Dave Akerman‘s first attempt at sending a Raspberry Pi to near-space, to our own Skycademy programme training educators in high-altitude ballooning. HABs and the Pi go together like the macaroni and cheese, peanut butter and jelly, chips and gravy…you get the idea. The RaptorTech team equipped their glider with a Pixhawk flight controller and the small $5 Raspberry Pi Zero to control the time point when the glider disconnects from the HAB, and to allow the glider to autonomously navigate back to a specific landing site. They made the glider out of foam core and coroplast, with a covering of tape to waterproof the body. Inside it were two cameras, two servos, the Raspberry Pi Zero, and the Pixhawk flight controller with added GPS tracker (in case the glider got lost on the way home). The electronics were protected by handwarmers from freezing at high altitude. The Raspberry Pi Zero ran a Python script to control the Pixhawk. At take-off, the Zero set the controller into manual mode to keep the glider from trying to fly off toward its final destination. When the glider reached a pre-determined altitude, the Zero disconnected the glider from the HAB by setting off a solid state relay to burn through the connecting wire. Then the Pi started up the flight controller to direct the glider home. You can find the code for this process here. Due to time limitations and weather restrictions, the RaptorTech team had to drop their glider from 10km instead of 30km as they’d planned. They were pleased to report the safe, successful return of their glider to about 10m from the pre-set landing point. If you’d like to follow the adventures of RaptorTech, check out their Facebook page. 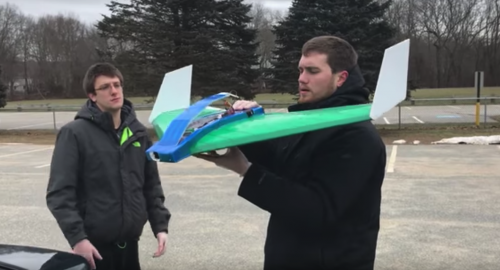 You can also follow them on YouTube and on their website for more RC plane-based mayhem. mmm,the nefarious potential of this cheap one-use only drone is quite scary. It’s no wonder the authorities take a dim view of it. Once again, I am drawn to the forks analogy. Forks have nefarious potential. They’re also very useful for eating spaghetti. You’re 200% right. I usually the pen/pencil analogy. Even plastic knifes can kill with one swift pull over someone’s jugular. tbh I was thinking of deliveries of goodwill messages and the like into prisons, from Gaza into Israel, between the Koreas and between the counties of Ireland. But ho hum. Perhaps the Canadians might consider it to get their Aluminium into the States ? tbh I was thinking of deliveries of goodwill messages and the like into prisons, from Gaza into Israel, between the Koreas and between the counties of Ireland. But ho hum. Perhaps the Canadians might consider it to get their Aluminium into the States ? Single-use gliders were used for human cargo during WW2 if I’m not mistaken. You inspire me to work on a fork-based trebuchet system. I think it is more of an air traffic thing. If you drop something by parachute, the Air Traffic folks can pretty well guess where it is going to go and keep aircraft clear. Something gliding could end up almost anywhere. I don’t see any of the FAA precautions that are required for High altitude balloon flights. Does the Rasberry Pi interface with the Pixhawk somehow? Do you have a wiring diagram?